Who set the 640K limit? We all know that "640K should be enough for everyone". But who actually set this limit? The quote is often attributed to Bill Gates, but it doesn't seem like a decision for an Operating System vendor to make. And does MS-DOS have some kind of 640K limit? Doesn't it just come from the hardware? But maybe Bill Gates was consulted on the matter, perhaps? And if he was, by who? I feel we need to establish a timeline of key decisions made in the IBM PC memory architecture. When did Microsoft become involved with the IBM PC design? Was the 8086 processor already designed? As far as I know, the 8086 has two magical addresses. The first is the beginning of vectors, which is address zero. The vectors need to be mutable, so RAM must be attached to this address. Thus each 8086 system needs RAM at address zero, the beginning of address space. The second magical address is the Instruction Pointer reset value, the location from where the 8086 starts execution. Since that boot firmware must be fixed, there must be ROM at that address. The end of memory space was chosen for this location, address 0xFFFF0 to be exact. Was Microsoft involved in these two decisions, which must have been done at Intel? I find that hard to believe. Who at Intel chose these addresses? Was it Stephen P. Morse, the 8086 principal architect? This leads to the biggest question at hand, the 640K limit. Who set it? Where does it come from? 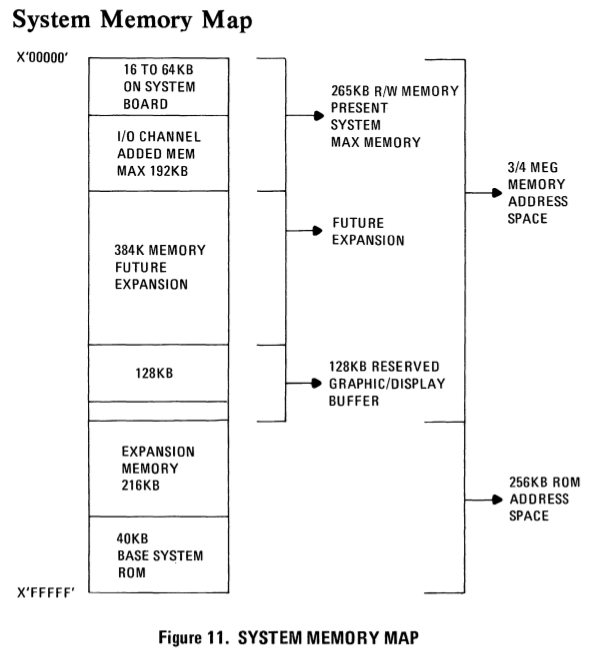 I know that EGA and VGA video cards have memory at that address, address 0xA0000 onwards. But didn't these cards come, like, a decade after the release of 8086 and the first version of IBM PC? So, was there a 640K limit in the original IBM PC? Or did that come later? Was there something attached to the 0xA0000 address in the original PC? Some original video card that was used on the PC? Something else? Who designed that hardware and chose that it would use the memory at 0xA0000? Having designed quite a few embedded computers already back in the days when external logic was always needed for address encoding, I can kind of see how it could have happened. In my imagination it's like "Ok, I've got this RAM at zero and the BIOS eprom at 0xF0000 so where should I place the video RAM...? Hmm, somewhere near the end, I think, so I can expand the main RAM... but not at the very end so I can expand the video RAM too... let's put it a 0xA0000, it's a nice round figure... we can change it at the next PCB revision anyway... Ok, ship it." But would it have happened like this? Was there some early consencus on breaking the continuous memory address space at 0xA0000? Who chose it? Was it some clerk behind a typewriter, making history? Some engineers at a meeting, late for a lunch appointment? Maybe some guy with a soldering iron or a wirewrap gun, hacking up the first prototype of... what? We need to get to the bottom of this, the world needs to know! which is detailed on subsequent pages: the system is supposed to provide between 16 and 64K of RAM on the motherboard, then up to 192K as expansion, with an additional 384K possible in the future (providing 640K RAM in total); then there’s a 16K reserved block, 112K for the video buffers (of which 16K at B0000 were used for MDA, 16K at B8000 for CGA in the IBM PC), followed by 192K reserved for a “memory expansion area”, then 16K reserved, and 48K for the base system ROM at F4000. DOS itself isn’t limited to 640K. Any amount of RAM (within the 8086 memory model’s limitations, i.e. up to slightly over 1MiB) could be used. This was the case in some DOS-compatible computers: the Tandy 2000 and Apricot PC provided up to 768K, the DEC Rainbow 100 and Sirius Victor 9000 provided up to 896K, and the Siemens PC-D and PC-X provided up to 1020K; the original SCP systems on which 86-DOS was developed weren’t limited to 640K either. On PC-compatible systems with memory available at 640K, typically provided by a VGA adapter, drivers could be used to add the memory from 640K up to 736K to the memory pool, increasing the maximum runnable program size. (This worked fine for programs which only used colour text mode, or CGA graphics.) Additional memory available in separate areas above 640K could also be added as separate memory pools, but that didn’t help run larger programs. Note that the 640K quote is likely apocryphal. the memory map was probably designed the way it was in order to provide a balanced set of expansion possibilities: a lot of memory, a decent amount of display buffers, and room for ROM expansion (in the IBM PC, there were no option ROMs; those appeared with the XT). CP/M put BIOS and BDOS code at the top of RAM, and IBM decided to copy that idea. Just like with CP/M systems, the plan was to raise the start of reserved memory from A0000 (640KB) to a higher value once newer chips like the 80286 arrived. This would have worked if end-user programmers like at Lotus obeyed MSFT's guidelines. However, they naturally wanted speed, and so wrote directly to memory addresses. This, of course, meant that all old programs -- which people paid a lot of hard-earned money for -- would instantly break, and so the range A0000 to FFFFF got permanently baked into PCs. Not the answer you're looking for? Browse other questions tagged ibm-pc memory-layout or ask your own question. Did IBM encourage Bill Gates to retain the rights over PC-DOS?